royaldutchshellplc.com is a Royal Dutch Shell gripe site and blog operated by Alfred and John Donovan, who engaged in several marketing campaigns with Shell during the 1980s and early 1990s. The father and son duo believe Shell violated intellectual property agreements and filed several law suits against Shell prior to starting several websites critical of Shell, including royaldutchshellplc.com. The site has been oft quoted in news sources and is known for its activities as an Internet leak and forum for Shell whistleblowers. The Donovans owned a chain of petrol stations in east London and Essex, for which they created many sales promotion campaigns under their company Don Marketing. In 1981, Don Marketing devised a promotional game scheme for Royal Dutch Shell called “Make Money”. Because the promotion was successful, Don created several other promotional campaigns for Shell, which led in part to Shell being identified as “perhaps the biggest user of games” in 1986. In 1992 Shell appointed a new National Promotions manager to whom Don’s promotional ideas were disclosed on a confidential basis. In 1994, Don Marketing issued a writ against Shell with respect to a follow-up “Make Money” promotion claiming breach of confidence and breach of contract, which ended in a £60,000 settlement. A second writ was issued concerning a Nintendo promotion that ran in 1993.. Shell settled both claims in October 1996. A third law suit was processed in 1999; however, the claimant abandoned the claim. During the course of the litigation, the Donovans founded the “Shell Corporate Conscience Pressure Group” and accompanying gripe site, which Shell UK Media Relations responded to internally in March 1995. After Don Marketing was dissolved, father and son Alfred and John Donovan created several websites to expose their perceived injustices while working with Shell, one of which is royaldutchshellplc.com. They also operate Shellnews.net. The site has been recognized by several media outlets for its role as an Internet leak. In 2008 the Financial Times published an article based on a letter published by royaldutchshellplc.com, which Reuters and The Times also covered shortly thereafter. The site has also been cited several other times by the aforementioned news sources as well as others. On October 18, 2006, the site published an article stating that Shell had for some time been supplying information to the Russian government relating to Sakhalin II. The Russian energy company Gazprom subsequently obtained a 50% stake in the Sakhalin-II project. Other instances where the site has acted as an Internet leak include a 2007 IT outsourcing plan, as well as a 2008 internal memo where CEO Jeroen van der Veer expressed disappointment in the company’s share-price performance. ^ a b “Royaldutchshellplc.com”. Alexa Internet. http://www.alexa.com/siteinfo/http%3A%2F%2Froyaldutchshellplc.com%2F. Retrieved 2009-05-01. ^ a b Garside, Juliette (2007-09-10). “Online Revolutionaries”. London: The Sunday Telegraph. http://www.telegraph.co.uk/finance/migrationtemp/2815430/Online-revolutionaries.html. Retrieved 2009-05-04. ^ “What About the Tiger Tails?”. Incentive Marketing and Sales Promotion Magazine per Shellnews.net. 1984-03-01. http://www.shellnews.net/PDFs/IncentiveMarSalesProMarch1984.pdf. Retrieved 2009-05-02. ^ Donovan, John. “The Shell Success Story”. Shellnews.net. http://www.shellnews.net/2007/shell-don-marketing-game-pieces.html. Retrieved 2009-05-02. ^ Donovan, John. “Games People Play”. Shellnews.net. http://www.shellnews.net/Media/sales-promotion-magazine-don-marketing-%20advert-%20june-1991.html. Retrieved 2009-05-02. ^ a b O’Sullivan, Tom (1998-04-23). “High Court papers unveil ‘secret’ Shell writ losses”. Marketing Week per Shellnews.net. http://www.shellnews.net/PDFs/MarketingWeek4pages23April98.pdf. Retrieved 2009-05-14. ^ Rines, Simon (1999-06-06). “Donovan takes Smart case against Shell to court”. Sunday Business per Shellnews.net. http://www.shellnews.net/PDFs/SundayBusiness6June99.pdf. Retrieved 2009-05-14. ^ Benady, Alex (1994-10-20). “Shell Struck by Writ”. Marketing Magazine per Shellnews.net. http://www.shellnews.net/PDFs/MarketingMag20Oct1994.pdf. Retrieved 2009-05-02. ^ “Don Marketing Limited V- Shell UK Limited”. Shellnews.net. 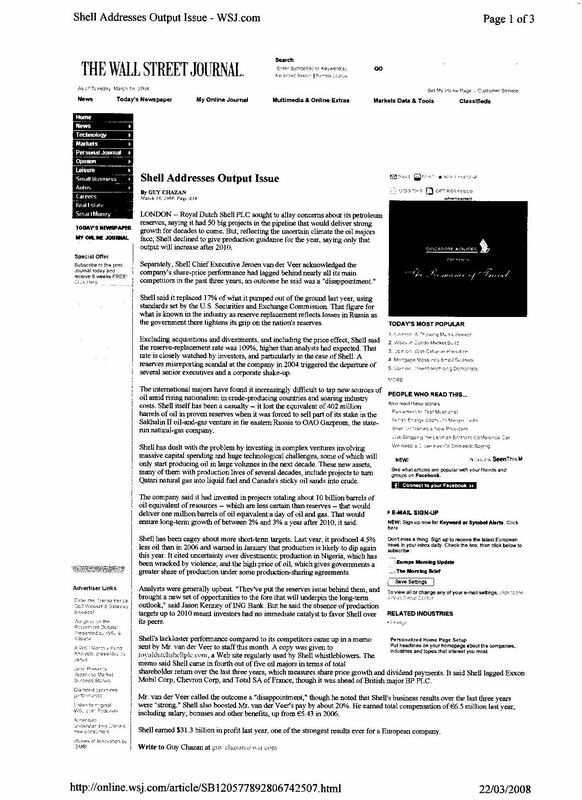 1995-03-17. http://shellnews.net/2006affidavit/shell-press-release-dated-17-march-1995.htm. Retrieved 2009-05-02. ^ “Pressure group to target Shell”. ‘Forecourt Trader Magazine per Shellnews.net. 1995-02-01. http://www.shellnews.net/PDFs/ForecourtTraderFebruary1995.pdf. Retrieved 2009-06-23. ^ “Don Marketing Limited -v- Shell UK Limited”. Royal Dutch Shell per Shellnews.net. 1995-03-17. http://www.shellnews.net/images/ShellComments.pdf. Retrieved 2009-06-23. ^ Cummins, Chip (2005-06-02). “Shell Wages Legal Fight Over Web Domain Name”. The Wall Street Journal. http://www.shellnews.net/PDFs/WallStreetJourn2June2005.pdf. Retrieved 2009-06-23. ^ Gervais, Daniel J (2005-08-08). “WIPO ADMIN PANEL DECISION”. World Intellectual Property Organization. http://www.wipo.int/amc/en/domains/decisions/html/2005/d2005-0538.html. Retrieved 2009-06-23. ^ Walsh, Dominic (2005-08-16). “In a Spin on Report”. London: The Times. http://business.timesonline.co.uk/tol/business/columnists/article555591.ece. Retrieved 2009-05-02. ^ “Shell Pension Scheme Value Falls 40%”. Financial Times per Shellnews.net. 2008-12-13. http://www.shellnews.net/wikipedia/FTcorrected12dec08.pdf. Retrieved 2009-05-02. ^ “Shell’s Pension Underfunded, Contributions Rise”. Reuters per Shellnews.net. 2008-12-12. http://www.shellnews.net/wikipedia/UPDATE%204%20Reuters%2012%20Dec%2008.pdf. Retrieved 2009-05-02. ^ “HSBC Hit by Fear Factor as Downturn Spreads to Asia”. Reuters per Shellnews.net. 2008-12-13. http://www.shellnews.net/wikipedia/Shell%20shares%20down%20Times%2013%20Dec%2008.pdf. Retrieved 2009-05-02. ^ a b Brower, Derek (2007-02-01). “Rise of the Gripe Site”. Prospect. http://www.prospect-magazine.co.uk/article_details.php?id=8209. Retrieved 2009-05-02. ^ Macalister, Terry (2007-04-19). “Thin Smile from Shell as it Sells Sakhalin Stake”. London: The Guardian. http://www.guardian.co.uk/business/2007/apr/19/oilandpetrol.news. Retrieved 2009-05-02. ^ Bergin, Tom (2007-12-21). “Shell to Cut Thousands of IT Jobs”. Reuters. http://www.itpro.co.uk/news/154929/shells-it-outsourcing-plans-lambasted.html. Retrieved 2009-05-02. ^ “Shell Addresses Output Issue”. The Wall Street Journal per Shellnews.net. 1984-03-01. http://www.shellnews.net/images/wsj17march08002.jpg. Retrieved 2008-03-18. ^ “Executive Bookmark”. Fortune. 2006-07-24. http://money.cnn.com/magazines/fortune/fortune_archive/2006/07/24/8381730/index.htm. Retrieved 2009-05-04. ^ Eringer, Robert (2007-09-10). “Gripe Sites are All the Rage Now”. Santa Barbara News-Press per shellnews.net. http://shellnews.net/wikipedia/7FEBRUARY2009GRIPESanta%20Barbara%20News-Press.pdf. Retrieved 2009-05-04. NOT IN THE WIKIPEDIA ARTICLE: WHAT IS REFERRED TO AS “A THIRD LAW SUIT” WAS IN FACT THE FOURTH. SHELL PAID ALL LEGAL COSTS AND JOHN DONOVAN RECEIVED A SECRET PAYMENT AS PART OF THE SETTLEMENT WHICH WAS NOT DISCLOSED TO THE TRIAL JUDGE. THE PAYMENT MADE BY SHELL TO THE SOLICITORS ACTING FOR JOHN DONOVAN WAS APPROVED BY SHELL CHAIRMAN, MARK MOODY-STUART, THE HUSBAND OF JUDY MOODY-STUART, WHO HAD PERSONALLY INTERVENED IN THE SAGA. SHELL SETTLED SEVEN COURT ACTIONS INCLUDING TWO FOR LIBEL BROUGHT BY THE DONOVANS. SHELL ALSO LOST THE WIPO ACTION BROUGHT AGAINST ALFRED DONOVAN BY SHELL INTERNATIONAL. SHELL HAS NOT WON A SINGLE CASE AGAINST THE DONOVANS. Posted in: Alfred Donovan, John Donovan, Royal Dutch Shell Plc, Shell, Wikipedia.